Hugo Chavez: Man With No Limits? You can’t, which is why Rodríguez says she’s conflicted about Venezuela’s referendum on Feb. 15, over whether to eliminate presidential term limits. 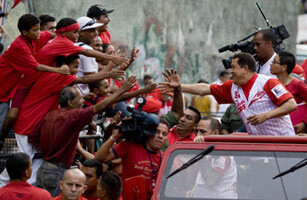 President Hugo Chavez wants to amend the constitution so that he can run for a third six-year term in 2012. On the hustings, the former paratrooper insists that only if he stays in Miraflores, the presidential palace, will “the people stay in power.” He’s taken to ending his rallies with a campaign slogan that anticipates the vote’s outcome: “Oo-ah, Chávez no se va!” Chávez isn’t leaving! Most residents of La Silsa hope Chávez is right. Like other poor Venezuelans, they’re grateful for the poverty-reduction programs and medical clinics Chávez has lavished on barrios like theirs. The potable water, power lines, subsidized grocery stores, community councils that give average people more political say  they had none of that 20 years ago. Since Chávez’s leftist revolution began in 1999, though, Venezuela’s oil wealth has been redirected into populist spending programs that keep the poor on side and Chávez in power. However you see it, ending term limits seems increasingly popular around Latin America. Chávez remains the standard-bearer of the region’s resurgent left; and after his first attempt to change the constitution, leftist Presidents Evo Morales of Bolivia and Rafael Correa of Ecuador had their own term limits relaxed by popular vote. Colombia’s conservative President, Alvaro Uribe, won’t deny that he hopes to engineer a constitutional fix letting him seek a third term when his second mandate ends next year. The trend has democracy watchdogs fretful about a return of the Latin caudillo.